Meet the green fairy courtesy of La Fête. 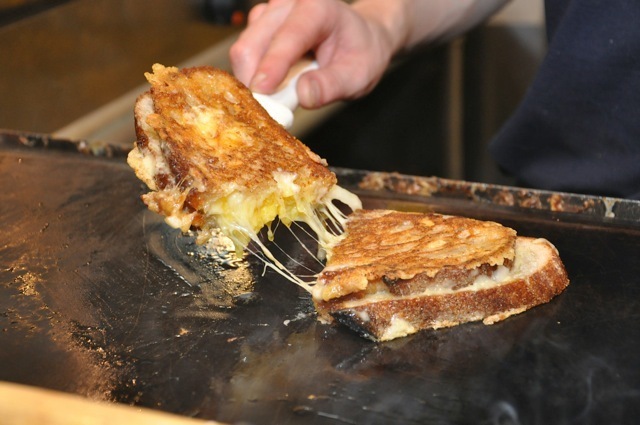 Delicious melty cheese from the Cheese Truck. Tea tasting from Comins Tea House. Ever tried pairing wine with perfume? It’s now just a couple of weeks until the fantastic foodie fest Feast returns to Tobacco Dock. It launches on 31 July and runs until Sunday 3 August, complete with street food, restaurants, masterclasses and music. As media partner of Feast, we will also have a presence at the show (stay tuned for details!) and are offering Londonist readers 2 for 1 on tickets. See below for details. Yes, you read that right. We’re not suggesting that Feast will be full of stuffed badgers, but a workshop at the show will give you the chance to work with chefs to create edible taxidermy. You don’t get that down the pub. Available on Saturday and Sunday only. 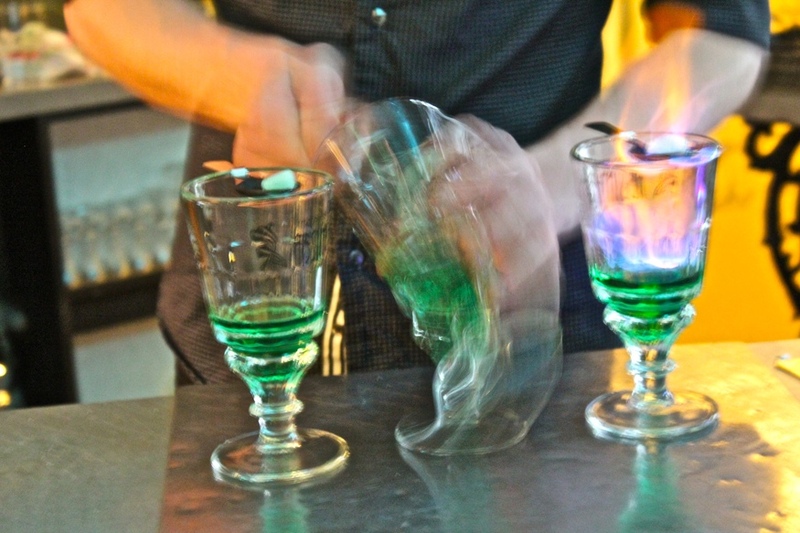 Or at least drink some absinthe. Track down Feast’s secret absinthe den and indulge in a tasting with La Fête as well as an absinthe cocktail, all for a tenner. What the day will hold after that, we can’t guarantee. Available on Thursday, Friday and Saturday. Don’t actually mix them together, obviously. Just attend a fascinating masterclass that shows how the fragrance you wear can affect the taste of the wine you drink. Seriously. Available on Thursday only. Because what could be better than combining the best bit of childhood with the best bit of adulthood? Alchemic producers Smith & Sinclair will be at the show selling boozy sweets made out of your favourite cocktails, from a whisky sour to a G&T. Because alcoholic sweets aren’t enough. Lickalix will be selling ‘poptails’ at the show, offering hot-weather coolers such as orange daiquiri, strawberry mojito, pina colada and Pimm's ice lollies. And you thought you couldn’t beat a Twister. If you’re anything like us, you don’t need much of an excuse to do this. The presence of mac ‘n’ cheese mistress Anna Mae at Feast is all the reason we could want. Try the Feast exclusive ‘Machos’: that’s mac ‘n’ cheese with beef chilli, jalapenos, guacamole, sour cream and corn chips. Epic. 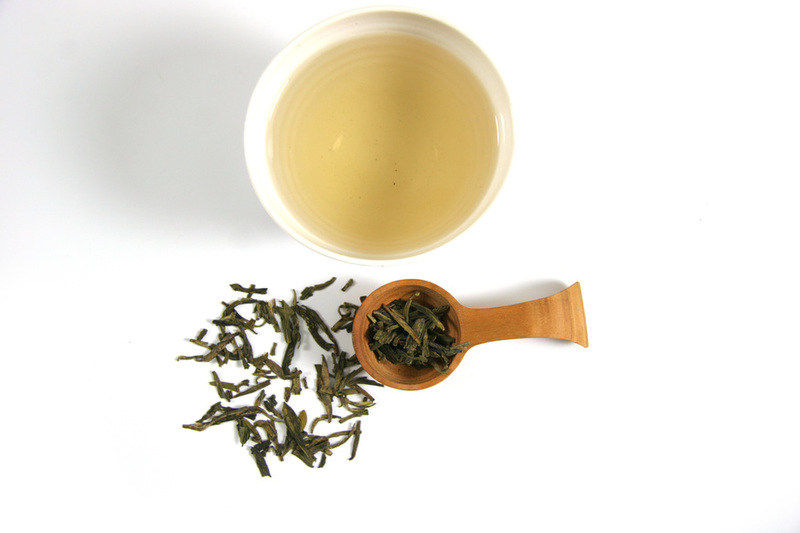 Comins Tea House will be selling its range of quality, single estate teas and exclusive teaware at the show, but you don’t have to wait until you’re home to get your brew on. An on-site traditional tea house will offer authentic tea ceremonies throughout the show, proving there’s way more to this great drink than a bag of PG Tips. Christabel’s just might be the ultimate bar to prop up. Coming to the show armed with its own herb garden, it will let visitors create concoctions by mixing and matching herbs, spirits and mixers. From the blissful to the bizarre, the choice is yours — there will be a mixologist on-hand to guide you, though. How do you tempt a bear out of a cave… oh, right, you’ve heard that before. Skip the cheesy jokes and head straight for the good stuff at Feast, where The Cheese Truck will be selling tip-top toasties. Try one with goats cheese, honey and walnut, or a combination of stilton, bacon and pear. 10. Say hello to us! We’ll be at the show, too. Put Sunday at 2pm in your diaries and look out for a Londonist session celebrating London’s best small-scale producers, foodie innovators and gastronomic entrepreneurs. See you there! Terms & Conditions: Available on Standard tickets only for any session from 31 July until 3 August. Not available with any other offer. Feast runs from Thursday 31 July to Sunday 3 August at Tobacco Dock, Wapping. Londonist is proud (hungry and thirsty) media partner to Feast.